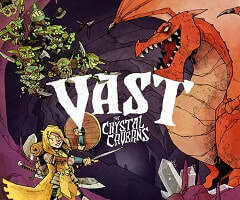 ​Vast - The dragon has been asleep for many long years. In that time, the cave under which it slumbered has changed greatly…Goblins and strange monsters have filled its gloomy depths and there are whispers that the cave itself has begun thinking, shifting, and growing evermore dangerous. Still, stories of peril rarely overshadow the rumors of riches. And riches there may be… For where a dragon slumbers, there also lies a fiercely guarded treasure. Fortunately for the slumbering beast, malevolent crystals fill the cave’s rooms with spectral light, hiding the entrance to the immeasurable treasure trove. Many have given their lives to the search and over the years the rumors have faded to legend. But the most courageous adventurers will not be discouraged by bloodshed. On this day, a knight steps into the darkness, her gloved hand gripping the hilt of her sword. Her years of quests--all of the victories and defeats--have led to this one final adventure. Knowing the kingdom can never truly be at peace with the dragon beneath the cave, she has come to make a final stand. Little does she know that she will awake everything that slumbers in the shadows… and begin the final battle in the darkness.